Last year around this time, I learned about kabocha squash. I'd enjoyed it for ages in the form of tempura at Japanese restaurant without ever quite knowing what it was! But luckily, Nami at Just One Cookbook revealed the mystery of the delicious kabocha squash, also known as "Japanese pumpkin". I started experimenting with roasting different varieties of squash last Fall and I discovered that I really love the kabocha above all else! What I love most about it is the texture. It's this wonderful combination of squash-potato, sweet-potato, and chestnut! It's usually got the texture and flavor of Japanese sweet potato as well, which I absolutely adore (I say "usually" because sometimes you get a drier-denser kabocha and other times, a "wetter", more squash-like, one). It's sweet and altogether delectable and really satisfying. Now that it's been in season, I constantly buy this green, knobbly and rough-looking squash to roast. I can put away a lot in one sitting! Now given my tendency towards routine, it's hard for me to break away from simply roasting-and-eating, but I managed to try something new - this soup! There's no cream necessary in making this thick, smooth, and creamy kabocha soup. I started with sweet onions and flavored the soup with a generous amount of grated ginger as well as garlic for a little kick to balance the sweetness. I add roasted kabocha, cooking everything together, before using the immersion blender to puree the soup until smooth. This is my husband's kind of way of enjoying kabocha and I also devoured my fair share of it. It's so hearty and satisfying. I do love to eat the skin of the kabocha though - amazingly, the rough and tough-looking skin is incredible soft and absolutely edible after cooking. So while I'm not about to give up on my roast-and-eat routine, I'll be more than happy to make a batch of roasted kabocha soup once in a while. When I buy kabocha, I look for one that's heavy for its size. A dull skin and bumps are normal (they're not exactly pretty); just make sure it is firm and there are no soft spots. You can stock up like I do and keep them like you would other squashes, in a dry place for a few weeks. I usually carefully slice the kabocha in half, remove the seeds, them cut them in big wedges to roast with a little olive oil and salt. I use the convection mode on my oven at 400 degrees and it takes about half an hour, flipping them around midway. For this soup recipe, however, it'll be easier to roast a kabocha in halves and scoop out the cooked flesh that you need for the soup. And for this soup, I drew inspiration from the butternut squash soup I make as well as this recipe. I opted to grate fresh ginger and garlic, and tossed in some turmeric and garam masala. I used chicken stock and adjusted the final consistency to our liking by adding a bit more at the end after pureeing. It's always good to add the minimum amount of liquid you think you'll need because you can always thin it out with a bit more stock or water at the end. The end result is something like butternut squash soup except the texture of the kabocha is denser and fluffier so that you end up with a somewhat heartier, more potato-like soup. It's sweet and a little spicy. This one was easy to love but if you're like me, you've probably never met a soup you didn't like. I find that I tend to love every soup I make at home! First roast the kabocha. Heat oven to 400 degrees. Rub kabocha with some olive oil and season with salt and a little black pepper. Place, cut side down, on a foil-lined baking sheet. Roast until flesh is tender, about 30-35 minutes. In a large heavy-bottomed saucepan, heat a tablespoon of olive oil over medium heat. Add onions, a pinch of salt, and cook for 5-6 minutes, until onions begin to soften. Add grated ginger, garlic, paprika, turmeric and garam masala. Stir well to coat and cook for about 1 minute. Add chicken stock and bring to a boil. Then, lower heat to a simmer, and cook for 8-10 minutes with the pot partially covered. Scoop out the cooked flesh of the kabocha, discarding the skin. 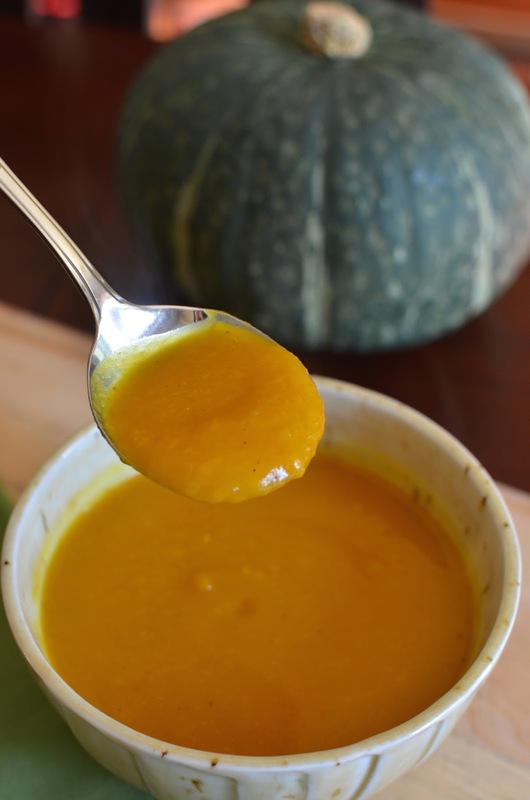 Add kabocha to the soup, stir together, and simmer for another 8-10 minutes. Let cool slightly, then blend with an immersion blender (or in small batches using a blender) until smooth. If necessary, add more chicken stock (or hot water) to thin the soup a bit. Taste, and season with salt and pepper, as needed. What a coincidence! I made some pumpkin soup for the lunch today too. Yours looks seriously creamy and delicious, Monica. Oh, yum. I'm sure that pumpkin soup hit the spot. I would love a big bowl of this soup! It's perfect for the chilly weather we've been getting! 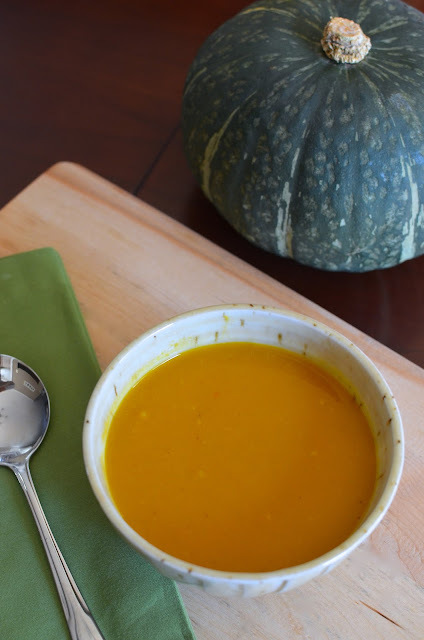 I can't get enough of winter squash right now and love how creamy and comforting it looks! I keep making batches of soup...they go so quick! : ) Hope you're keeping warm. This soup looks so creamy and incredibly delicious! Yes, it makes the whole thing just fluffy and thick. Love my kabochas! What a lovely colour and such a great soup for this time of year. Kabocha is definitely one of my favorite squash...I have never made soup with it...sounds and looks delicious Monica, especially roasting before. I just popped some Delicate squash in the oven for dinner. I am a roasted squash nut! The sounds looks and sounds wonderful especially with no cream! Beautiful color and texture. Hi Monica, love the spices that you used here, I could eat this all day, looks delicious! I might have added more ginger than I wrote in the recipe ; ) but I love a lot of kick! That's the fun part of cooking - it's so much more flexible! : ) Have a great week! We always hear about kabocha but I don't know if we get it here in Australia. We have a pumpkin called Jap pumpkin and I wonder if that is it? So glad Nami-san introduced you to kabocha squash. Sometimes it is difficult to find acorn, butternut here but can always find kabocha here in HK and of course Japan. I love the fact that you have not added any cream but kept it clean and delicious with plenty of warming ginger. I love drinking soups this time of the year. It just makes you feel so warm and comfortable! I am loving this soup! It's like a warm, cuddly hug in a bowl! It's a great feeling to warm your hands with a big bowl of hot soup and then enjoy it by eating it! : ) It is super comforting, I agree! Oh this soup looks fantastic! I love that there's ginger and tumeric in here! Kabocha is a favorite of mine but I must admit I tend to overlook it for butternut. Which must change! Delicious! Such a lovely colour. I LOVE the Asian flavours in it and the fact that it's healthy (no cream added). On our side of the world we don't get so many varieties of pumpkin. But I am going to try it with butter nut squash. I make a similar butternut squash soup and just mostly adapted it here. All good stuff! I can see why you love the texture in this soup - it looks perfect!! Yum! Kabocha is my favorite squash! They really make the best tempura. I actually prefer them more than the shrimp ones. :P This soup sounds amazing with all that spices. What a great soup for this winter time! I'm seriously getting ready to roast another in a bit. Love them so much. I wish I knew about them earlier!